Camp David Mom sweatshirt comes in either gray or cardinal. Very soft material is 52% polyester / 48% rayon. "Rose-Hulman" over "Mom" in white on chest. Please select option for Camp David Mom Sweatshirt. Gear cardinal Dad hooded sweatshirt in 80% cotton / 20% polyester. Imprinted "Rose-Hulman" over "Engineers / Dad" over Rosie the Elephant. Please select option for Gear Dad Hooded Sweatshirt. Gear cardinal Dad t-shirt in 100% cotton. "Rose-Hulman" over "Engineers / Dad" over Rosie the Elephant. Please select option for Gear Dad T-Shirt. Gear two-tone long-sleeve Mom t-shirt. Front and sleeves are a light gray, while the back of the shirt is charcoal gray. 50% cotton / 50% polyester. 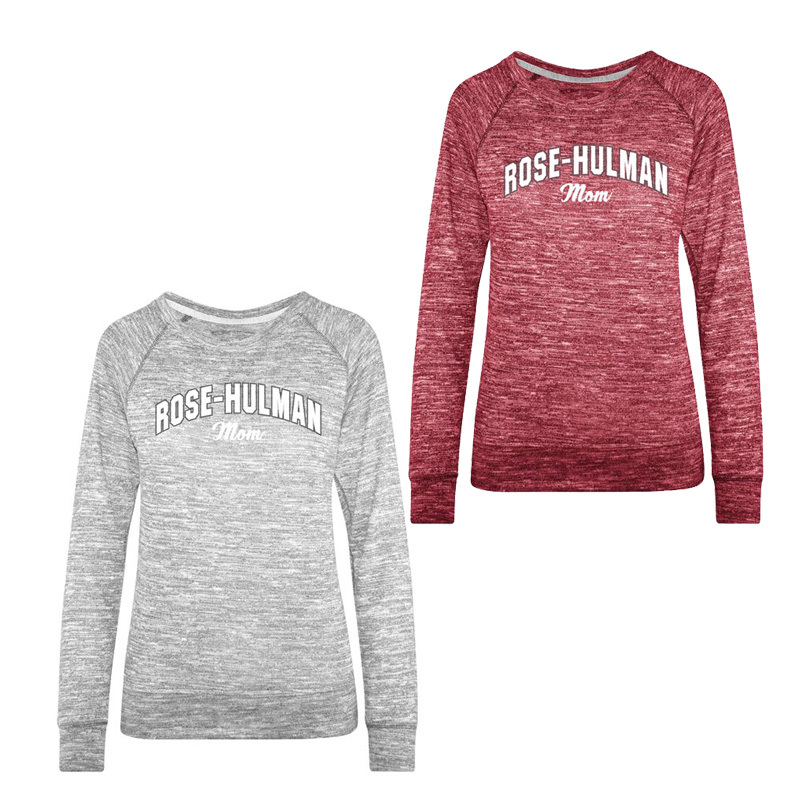 "Rose-Hulman" over "Institute of Technology" over "Mom"
Please select option for Gear Long-Sleeve Mom Shirt. Gear Mom sweatshirt. Soft gray sweatshirt that is 75% cotton / 25% polyester. Imprinted "Rose-Hulman" over "Mom" over "Fightin' Engineers"
Please select option for Gear Mom Sweatshirt. Gear lightweight Mom sweatshirt. This white and gray striped sweatshirt is made of 70% cotton / 30% polyester. Super comfortable for those chilly days. Front pouch pocket. "Rose-Hulman" over "Institute of Technology" over "Mom"
Gear cardinal Mom crew neck sweatshirt. Very soft, 80% cotton / 20% polyester. "Rose-Hulman" over "Institute of Technology" over "Mom"
Gear Mom t-shirt. 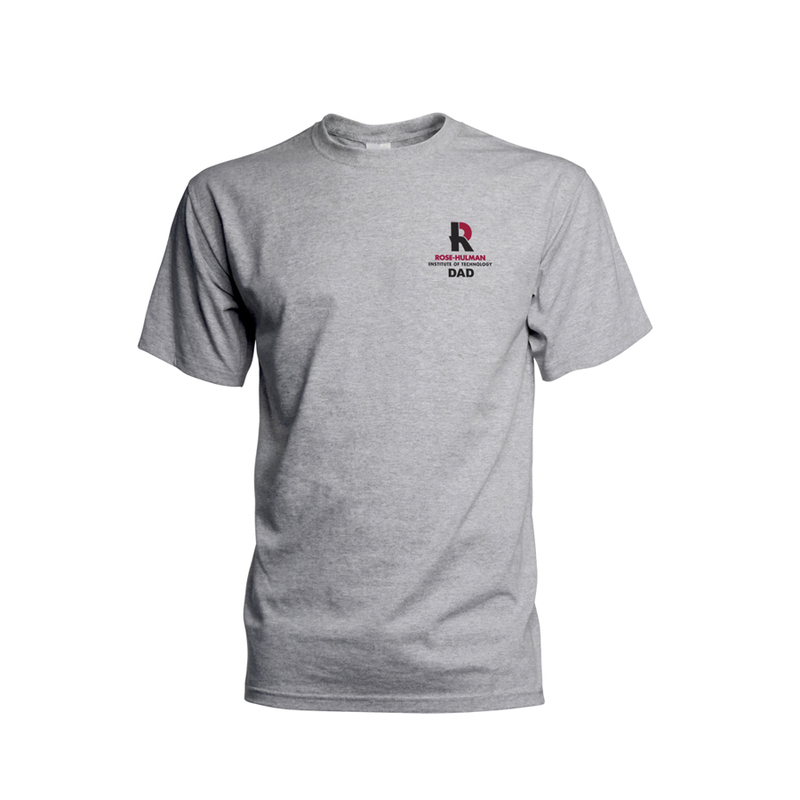 Soft gray t-shirt that is 90% cotton / 10% polyester. "Rose-Hulman" over "Mom" over "Fightin' Engineers"
Please select option for Gear Mom T-Shirt. Gear cardinal Dad sweatshirt in 80% cotton / 20% polyester. "Rose-Hulman" over "Engineers / Dad" over Rosie the Elephant. Please select option for Gear Sweatshirt for Dad. Please select option for J America T-Shirt for Dad. Neil Grandpa mug. Gray background with "Rose-Hulman" arched over "Grandpa" over "Est." over "1874" in white on both sides.